I've been fortunate enough to visit the Montreal Museum of Fine Arts (Beaux-Arts de Montreal) quite a few times over the years and the one sculpture that invariably captures my complete attention every time is "The Road To Enlightenment" by British Sculptor Marc Quinn. 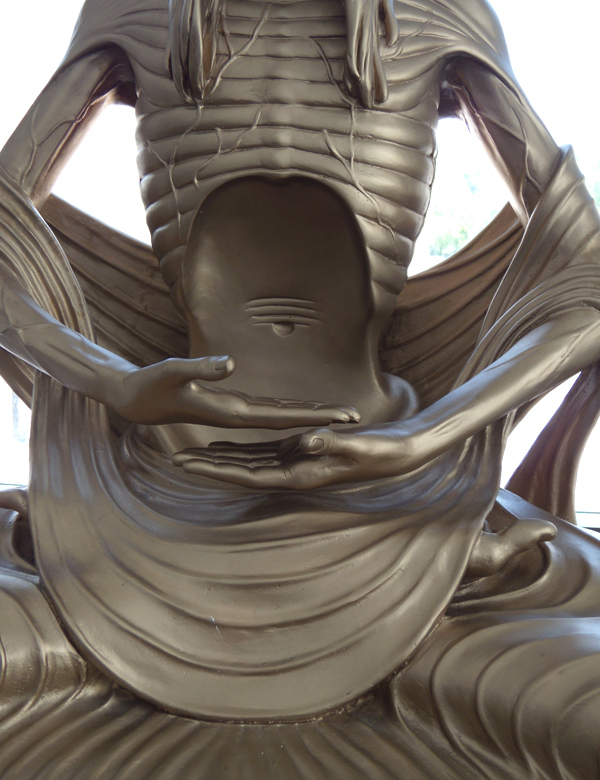 It's not just the startling appearance of the yoga-like figure that always draws me in, but also how the sculpture radiates a complete sense of peace and calm. The Road to Enlightenment is a really good study in juxtaposition. 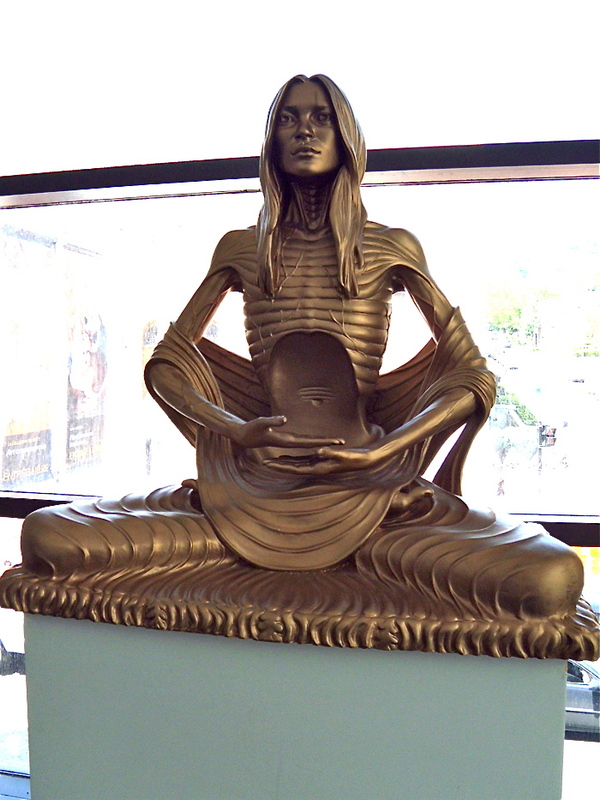 The Road to Enlightenment was one in a series of bronze sculptures that was originally created as part of the series, "Sphinx", that premiered at the Mary Boone Gallery in New York in 1997. 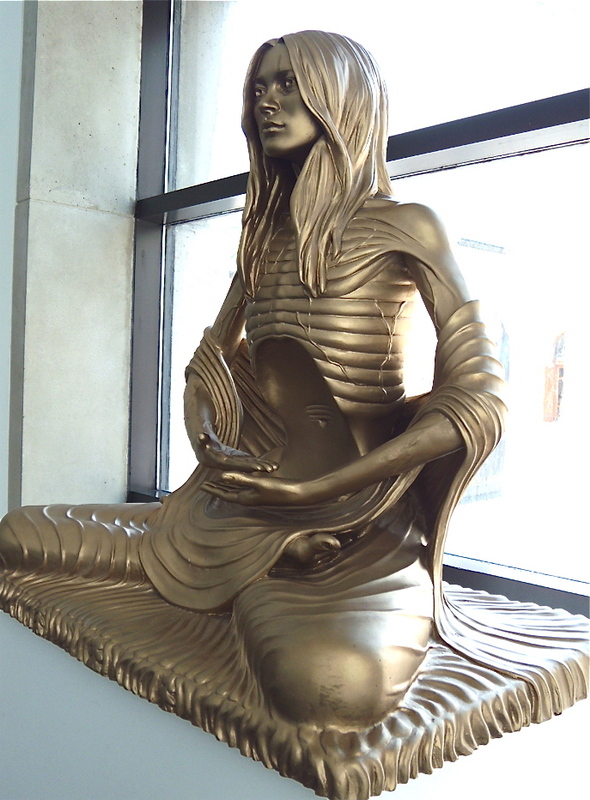 If the figure in the piece looks familiar, it's supermodel Kate Moss. Quinn often depicted the images of real, recognizable people his sculptures. He was interested in using their images to help him convey various ideas and emotions that he wanted to explore. Coincidentally, a few months ago, I ran across another an image of Kate Moss enshrined in a hologram at the Alexander McQueen Exhibit at the Metropolitan Museum of Art in New York. Seeing her image used by two different artists, in two different exhibits, within a few months time was pretty interesting. And reflecting back on Moss as a central figure in fashion almost 15 years later, I think the general public tends to forget the muse she played for so many important artists and designers. As with all artwork, the Quinn sculpture leaves itself open to a number of different interpretations depending on the viewer. I wanted more information about the piece and after some research found an interview that Quinn had given Jason Shulman in 2009. He discussed some of his ideas and how they worked their way into this particular series. Copied below is an small excerpt from Quinn's interview which pertains specifically to "The Road to Enlightenment". "JS: Your sculptures often depict real people, such as Kate Moss, Alison Lapper, Thomas Beatie, your wife, your son and so on. Do you want to depict the subjects as they really are, or do they symbolize an abstract idea? MQ: Is is not only Kate Moss who is a real person and an image, everyone has both qualities as well. Although they may not be articulated in a public way, in a sense my job is to find people who can represent ideas and emotions which can make sense in my art, and be themselves and somehow refract something about the world as I see it.... So they are about both, and people are both the real and conceptual representation, it depends on the person, how far away from the real person the image is. For instance, in the case of Kate Moss, the image I would say has a completely autonomous and complex life. JS: So Siren is a continuation of this idea of mapping people and their images? JS: You made a series of sculptures of Kate Moss in the past few years which seem to culminate in Siren. .... In The Golden Road to Enlightenment you have the other ascetic extreme where the body is withering but the face is unchanging, that idea that people live in the fourth dimension of time, where images are out of time. In the Buddha life story there is a part where the Buddha to be joins a group of Ascetics and renounces food to the point almost of death but then rejects this as a road to enlightenment and chooses the middle way. My sculpture is based on a fabulous Gandharan period sculpture of the same subject in the Lahore Museum, however in a modern, fucked up sort of way, that ascetic impulse has been corrupted into the idea of being thin and extreme anorexia, which is an addiction to control really and of course our bodies and lives are really out of our control. In that way we can't stop time, we have to roll with it". If you would like more information about artist Marc Quinn and his work you can visit his website. And if you are ever visiting Montreal please visit their wonderful art museums. They are well worth a few hours of your time. Such an intriguing concept, too. The representations in Quinn's work are very dynamic. Thanks for sharing! really great her work has remain always a source of inspiration to many, with proper yoga it has been found that many fatal diseases gets cure and even, Your tolerance for stress decreases. Your spirit no longer settles for the status quo and demands to be heard. Priorities change.